Just in case you have some weird vendetta against cookie dough (Commie! 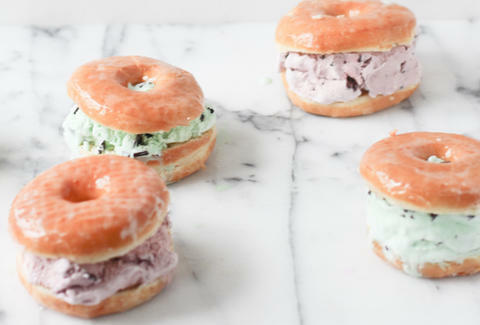 ), but embrace the cookiewich concept, Paper & Stitch invites you to create your own donut ice cream sandwiches... something we really should have thought of sooner. Once you've obtained your preferred glazed donuts and ice cream flavors, all you have to do is slice the donut in half and scoop on as much Lazy Sunday, Rocky Road, or Neapolitan (COMMIE!!!) as your heart desires. Dipping in chocolate syrup is optional, but strongly encouraged. Kristin Hunt is a food/drink staff writer for Thrillist, and would be okay with ice cream replacing Boston cream as the premier donut filling. Follow her at @kristin_hunt.